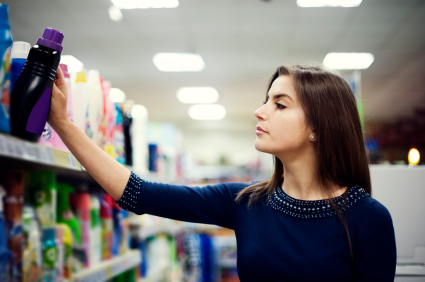 Look down a shopping aisle and you will find that labels on household and personal care products list a litany of chemical ingredients. Consumers who prefer less industrial alternatives can choose “green” or “natural” products that claim to be chemical free, but what actually goes into them is often unclear. A 2012 study published in Environmental Health Perspectives, “Endocrine Disruptors and Asthma-Associated Chemicals in Consumer Products,” analyzed the composition of 42 household cleaning and personal care products and 43 “chemical free” products. — The products analyzed contained 55 different chemical compounds: 50 were found in the 42 conventional samples representing 170 product types, while 41 were detected in 43 “chemical free” samples representing 39 product types. — Eleven chemical compounds were detected at concentrations greater than 1%, and 26 were detected at concentrations above 0.1%. — Parabens, a class of chemicals that has been associated with reproductive-tract issues, were detected in seven of the “chemical free” products, including three sunscreens that did not list parabens on the label. — Vinyl products such as shower curtains were found to contain more than 10% by weight of the compound DEHP, which when present in dust has been associated with asthma and wheezing in children. Christopher Olver is a Shorenstein Graduate Researcher at Journalist’s Resource, a project of the Harvard Kennedy School’s Shorenstein Center and the Carnegie-Knight Initiative. This article is republished under terms of a Creative Commons license.